As noted in my recent article, I love board games! One thing I didn’t have time to go into in that article are the many “expansions” that have come out for many popular games. Expansions breathe new life to a familiar game by adding new rules and generally add new game components such as advanced pieces, or a new map. They generally increase the length and complexity of the game they expand, and they vary from a few dollars for a few cards and new rules, to nearly the same price as the game they expand. The Settlers of Catan is the archetypal mainstream eurogame. It has as many reissues, expansions, and spin-off games with similar rules as any other game. The most famous expansion for this game is the Cities and Knights of Catan, which is on the higher end of the scale in terms of added complexity and cost. It turns a game which can frequently be completed in around an hour into a game which frequently takes 2 hours or more. I really enjoy this expansion, but it is practically a whole new, more complex game based on the idea of the original. This is a good example of a large expansion which makes you really rethink your approach to the game. Race for the Galaxy is a recent card game. As I noted in my earlier article, it is complex to learn but fun to master. It has two expansions so far, both adding relatively little new material and rules. Unfortunately, the expansions are pretty pricey for what they add. The first expansion, The Gathering Storm, simply built on the rules of the original, providing a little more options for growth, without changing the formula for success. The second expansion, Rebel vs. Imperium, added new attack mechanics which changed the tone of the game and increased the complexity a good bit. Overall, both are examples of mid-sized expansions which evolve the game by adding new ways to win, without breaking old techniques. One of my favorite games, also turns out to be the king of expansions and spin-offs; Carcassonne. It’s simple design and modular tile-based gameplay is easy to extend and reimagine. Carcassonne has seen 6 mid-sized expansions, 8 small expansions, 7 spin-off games (one is for children) and a card game only tied to the rest of the series by name. I had collected every expansion and spin-off in the series until recently, when they released a poor game and a poor expansion in the series the same year. The expansions alone are difficult to keep organized, since they all consist of square tiles which are difficult to distinguish from one another. This is why I am famous, if only amongst a small number of board game enthusiasts on the popular Boardgamegeek website. To aid in my own organization, I designed a set of printable “tuck boxes” that store the tiles from one expansion so I can keep them separate from other expansions and the main game. I designed boxes for a few of my favorite expansions quickly in PowerPoint, printed them on cardstock using a color laser printer and then folded and taped them into perfect little boxes. Pleased with my work, I shared them with other Carcassonne players. 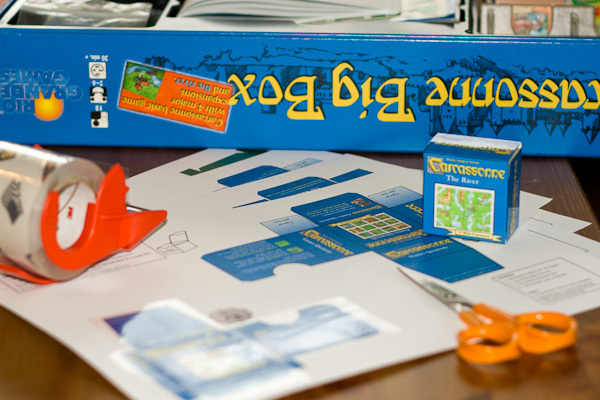 Assembling a Printable Tuckbox for Carcassonne which I designed. I would like modify it so I can create my own tuck box for a different expansion. When I updated the tuckboxes to include another expansion, I added a note indicating that I would like to locate a copy of the carcassonne expansion The Cathars, which was release several years earlier with the german gaming magazine Spielbox. It wasn’t broadly available anymore, except on ebay for 40+ dollars a copy. I saw in your tuckboxes from boardgamegeek.com that you were wanting a copy of Cathars. Are you still looking for one, or is this old information? I have all of your tuckboxes, in fact, and use them to be able to store the entire game in the orignal box, which would be impossible otherwise. … I particularly like how you have put the expansion name on the top flap, since that is how I store the boxes in the main box. If that wasn’t strange enough, there is a community of Carcassonne enthusiasts who are constantly producing fan-made expansions to the game. I was contacted by one member of that community who wanted to use my templates to create tuckboxes for his fan-made expansions. Tuckbox for a fan-made expansion made by someone else based on my design. I have continued to get ideas, requests, thanks and general appreciation for my work via email and the boardgamegeek website. It always makes me smile when I get another friendly message for my work. 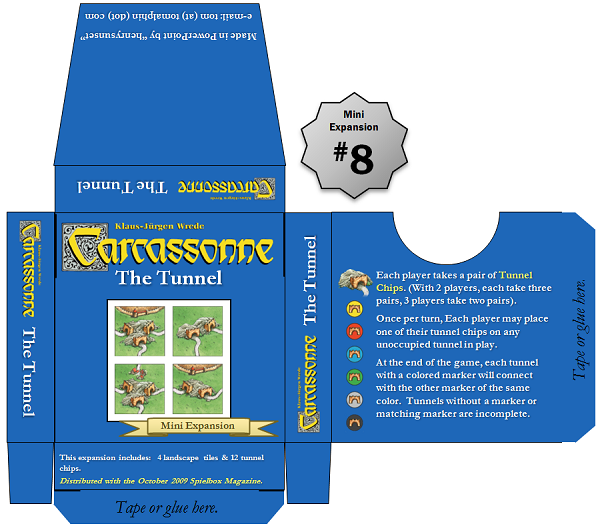 The latest addition to my Carcassonne tuckbox collection for the Tunnel expansion which came out in the fall. So far, my collection of tuckboxes have been downloaded over 4700 times. Yesterday, I released an update to the tuckboxes to include the latest expansion, The Tunnel, even though I don’t have a copy yet. Only time will tell how the Carcassonne franchise will grow, and if I will be able to keep up with the never-ending expansions! Previous story First round of Seedlings. Your tuckboxes are Great! Thank you so much for posting them and allowing others to alter them, they have really been wonderful. The tiles fit perfectly. Thank you so much for designing these. I can’t wait to try them out! I’ll continue to browse your blog for a blank template, but if I am unsuccessful in finding one, is there any chance you can point me in the direction of one? Did you find out allready of the latest two expansions to Carcassonne ? The plague can be ordered online at Spielebox (english edition of mag!) 6 tiles with chips. Beeing posted to me now.. looking forward. Are there any expansions you do not have still? I didn’t tried yet your tuckboxes but I’ve to say they are very cool! You’ve done a great job! 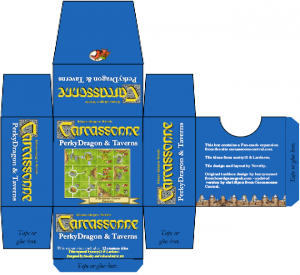 I love Casrcassonne too, and I love to have my things propperly organized, so I will print your little boxes because they are perfect! Not only do we need to go rock climbing and mountainbiking, we may also need to play Settlers together too! I think we have the Seafarer’s expansion pack. Hi, thank you for your tuckboxes. They are great. I’m a big fan of the game and have all the expansions and varieties. Now i’m wondering if you will make tuckboxes for the varieties mayflower, hunters & gatherers, discovery and ark of the covenant. or do you have a template to make them myself? Once again thanks for your great work!!!!! Hi, your tuckboxes are great. Thanks! Thank you so much for creating these tuckboxes! If you could see my Carc box right now, you would know how much I love them! My only problem is that with the new expansions — the Minis — I’m going to run out of room! You need a Kickstarter campaign for this! Love your boxes! Are you planning on boxes for the kloosters, halflings and the school? Keep up the good work!